Maggie's adventures in the Enchanted Forest continue in the second book of a new young fiction series by E.D. Baker! With each day, Maggie is finding it harder and harder to get along with her stepmother and step-siblings while her father is away. It doesn't help that every time Maggie finishes cleaning laundry, flying pigs swoop in to muddy everything up and get her into trouble! One day while she's out collecting berries and her stepbrother is fishing, Maggie happens to catch a magical fish herself! The fish promises to make one of her wishes come true, but only if she frees him. 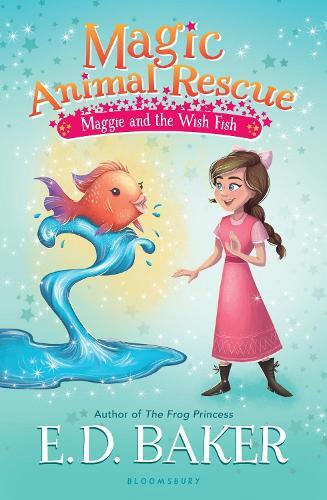 Maggie wants a new family more than anything, but how much faith can she put in a talking fish? This new black and white illustrated series is perfect for fans of Princess Ponies, Magic Animal Friends and the Emily Windsnap series.